Now is the time for action and planning. Make your travel plans today. Discover how you can do more with less at IBEX 2009 – October 12-14 at the Miami Beach Convention Center. Register today at www.ibexshow.com and let’s make progress happen! In addition to being one of the best venues for conducting business with manufacturers, gaining exposure to key industry developments, IBEX 2009 will offer three free seminars designed specifically for marine dealers as part of its new IBEX Dealer Development Days pavilion. 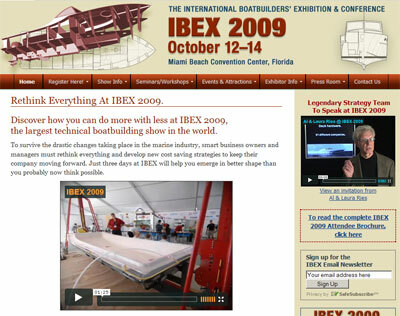 IBEX 2009 is being held October 12 – 14 at the Miami Beach Convention Center. Dealer Economics: How to Survive, is presented by Michel Weisz with Berger Singerman, a Florida based business law firm that serves a diverse client base. Being held Monday, October 12, it will address the changing economics of the marine dealership. Weisz will offer insight and guidance on survival in today’s marketplace, including debt conversion, long term workouts, downsizing, and reorganization. Stop Scaring Your Banker: What You Need to Know, is presented by Bill Thompson with the Cardinal Points Network on Tuesday, October 13. Dealers will learn how to appeal to commercial floorplan lending partners, strategies for finding the right lender, skills for communicating with commercial bankers, as well as how to build a comprehensive and effective floorplan loan request package. Tips on how to achieve commercial lending needs and employing business partner ABCs (Accountants, Bankers, and Legal Counsel) will also be covered. Keep Your Dealership a Top-Notch Performer, Volvo Penta and Boating Industry magazine team up to offer a theoretical and real-life review of dealership best practices on Wednesday, October 14. Practical examples of company enhancements, ranging from training/education to product and market planning will be covered. Dealers will learn from case studies on dealership success to gain ideas on growing their individual businesses. This seminar also covers corporate goal setting; planning for dealership as well as market, succession, and financial planning; and a variety of product strategies and tactical activities (service department training, marketing events, inventory management). Speakers for this session are Susan Bonivich and Phil Gaynor (Volvo Penta) and Matt Gruhn (Boating Industry magazine). To date, three leading boat builders have signed up to participate in the IBEX 2009 Dealer Development Days, the new and innovative boat building stimulus program to assist boat manufacturers and dealers in conducting crucial in-person business at a minimal cost. Discount hotel rooms are being offered to all marine dealers interested in participating. Boat manufacturers and dealers interested in learning more about the free seminars should contact Tina Sanderson at 802–879–8324 or Anne Dunbar at 716–662–4708. IBEX 2009 offers a complete seminar and conference series, as well as free workshops. The show will host more than 500 exhibitors, provides special pavilion areas, and hosts a special outdoor demonstration space where industry professionals can utilize the latest products in real-world application situations. Complete information on IBEX 2009, including registration, is available on www.ibexshow.com. IBEX 2009 will take place at the Miami Beach Convention Center. The show is open Monday, October 12, from 10:00 a.m. – 6:00 p.m. (with a special opening night presentation featuring Al & Laura Ries at 6:30 p.m.); Tuesday, October 13, from 10:00 a.m. – 6:00 p.m.; and, Wednesday, October 14, from 10:00 a.m. – 3:00 p.m.
IBEX is owned and produced by Professional BoatBuilder magazine and National Marine Manufacturers Association (NMMA) and is the largest boating industry gathering of 2009. For boat builders, marine industry dealers, designers, repairers, surveyors, and boatyard/marine operators, IBEX is the single source for the latest boatbuilding technologies, tools, and materials.